Diff Lockers, The Ultimate In Traction Aid. The ultimate in traction aid is diff lockers. Why do I need differential lockers: When driving off road on the tougher tracks or simply come across some real uneven terrain, at some point will cause either a front or rear or even both front and rear wheels to lift of the ground or just loose traction. When that happens the power will always take the path of least resistance, which will be the tires with least traction. 79 Series Landcruiser using factory diff-lockers. One is momentum which will get you through in most cases. But momentum requires continuous movement, which becomes a damaging problem when rock crawling, slowly navigating a technical part of a track and what if all momentum has been lost due to lifting wheels too much on a rutted hill climb. The other way to tackle this traction issue is to install a locker. A diff locker locks the differential forcing both front or both rear wheels to rotate at the same rate even if lifting a wheel in the air. There are a few different types of lockers, air lockers (ARB air locker) and electrical diff locker (Detroit E-locker). One is powered by an air compressor and the other by an electrical motor, both do the same thing and will operate by switches installed on you dash board. Diff lockers do add stress to the axels, CV,s and diffs but far less stress than a fast spinning lifted wheel that suddenly hits the ground, if that were to happen on a hard surface with good traction something would likely break. Driving with lockers is all about switching them on and off at the rights time. Landcruiser Dual cab on 35's Locked front and rear. This is a divided debate, many would say the front is better to lock than the rear and others would say the other way around. I personally sit on the fence in this debate, as I have had just a front locker for a while before I got the rear locker fitted as well. I have found both to be very useful by themselves (just using one), but you can't beat having both front and rear. Having a Front Locker only will mean the vehicle will still have Limited Slip Differential or LSD (most 4wds have this as a stock feature) this acts as a semi locker however it's only really useful with a front locker engaged as it will still slip. When the front is engaged you will notice steering is also gone, this is because both wheels are rotating at the same rate, too much turning of the wheel will cause unnecessary wear and stress on both the driveline and the steering. Only use front lockers on straight sections of the track, once the corner has been passed just switch it on again when needed. The front differential is generally weaker than the back, if driven too hard too often something might give way one day (just don't abuse the 4x4 and there should be no need to worry). Having front only will still give the vehicle the benefit of its rear LSD on the black top which is what it was designed for (better Tarmac traction). Having a Rear Locker only will take away the 4wds LSD (unfortunately you can't have both Locker and LSD in the same differential) which will require you to use the switch more than you would have as there is no longer LSD assisting with traction, but this isn't a problem anyway, you got it so you could use it. Rear locker is more useful than the front when it comes to hill climbs and descents, on a hill climb most of the weight is transferred to the back so it makes perfect sense that the rear is working harder. 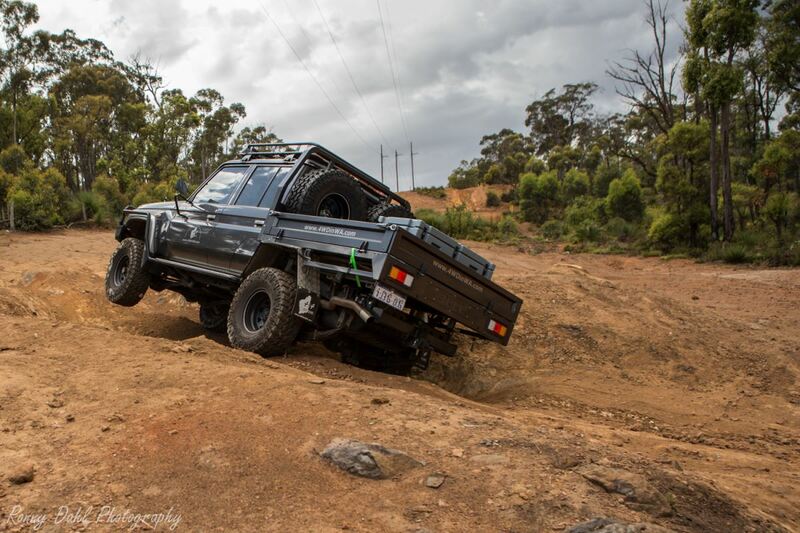 Hill descents engaging the rear locker will help keep the 4wd straight as both back wheels are forced to rotate the same rate, this massively reduces the risk of sliding sideways. SR5 Hilux using air diff lockers. 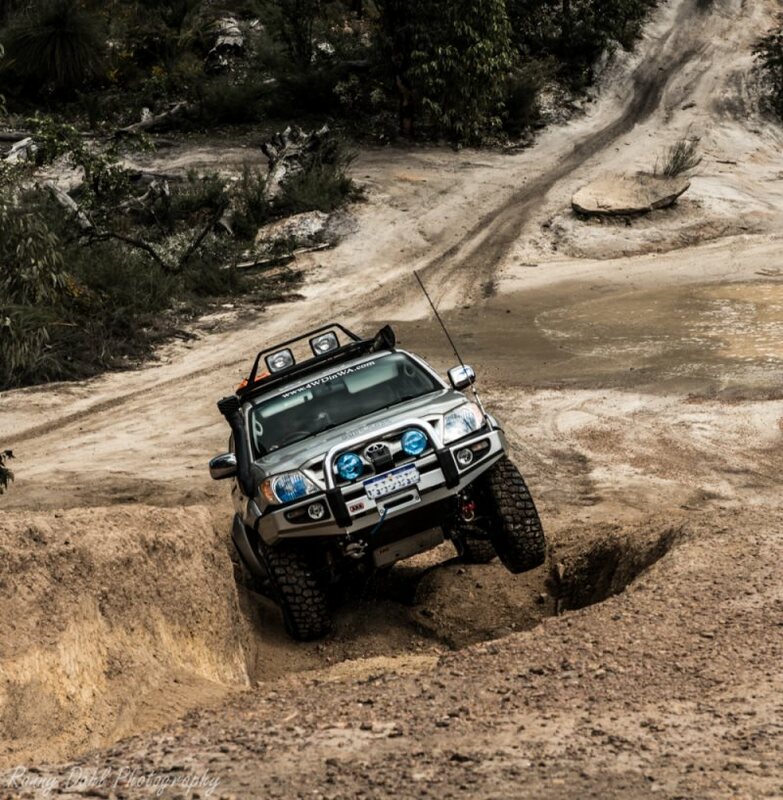 With both installed a 4wd will be unstoppable, just remember NOT to use the front when turning corners and when descending hills. Diff lockers will double your fun on the harder tracks. They will also assist in self recovery and save the 4wd from damage. Leave Diff Lockers And Go To 4 Wheeling In Western Australia Home Page.